Dubai, March 6th 2018– W Motors, the first Arab brand of high-performance luxury sports cars from the Middle East, achieved a new milestone today with the world premiere of the Fenyr SuperSport launched at the renowned Geneva International Motor Show. W Motors was also joined on the stand by partner ICONIQ Motors, based in China, who unveiled in parallel their brand new electric SPVs ICONIQ Seven model in VIP edition. Held every March, in the Swiss City of Geneva, the 88th edition of the international motor show will be hosted at the Geneva Palexpo similar to every year and is considered to be the most important Motorshow among all others, establishing a perfect demonstration platform for the world’s automakers launching new concepts, prototypes, technical breakthroughs, world premieres and international partnerships. Unveiled previously in a private event held at W Motors first flagship showroom in Dubai end of 2017, the Fenyr SuperSport is the latest masterpiece created by W Motors in a limited production of only 25 units per year. Entirely developed in-house by the W Motors Design Studio based in Dubai and equipped with the custom high-performance powertrain created by RUF Automobile in Germany, the Fenyr SuperSport becomes a performance-focused machine at its core, embodying the greatest performance, power and speed possible. Named after the most ferocious wolf in Norse Mythology, the son of Loki, the Fenyr SuperSport is not only an aesthetic prodigy distinguished by the unique W Motors DNA lines, but also a technical wonder developed in close collaboration with international leading technical companies and partners, like Magna Steyr Italy, RUF Automobile Germany and Studio Torino. Among the plethora of distinctive features, we can name the reverse door system, innovative active aerodynamics system, full exterior body in carbon-fibre with extensive use of graphene composite, transforming the Supercar into a lightweight (1,350 kg) and high resistance machine, custom-made RUF twin turbo flat 6, mid-rear 3.8L engine capable of delivering 800HP and 980NM Torque, making it possible to reach 0-100 km/h in just 2.7 seconds and a maximum speed of 400km/h. The W Motors Fenyr SuperSport is available worldwide with a starting price of 1.4 million USD. Talking about the Fenyr, Ralph R. Debbas, CEO and Chairman of W Motors stated, “We are thrilled to launch the Fenyr SuperSport today, through the Geneva International Motorshow platform, which represents the culmination of years of hard work by W Motors and its numerous technical partners in the automotive industry”. Alongside the new Fenyr SuperSport, W Motors’ partner, ICONIQ MOTORS exhibited the ICONIQ SEVEN VIP Edition for the first time in Europe. Also available in Premium and Mobility variants, the ICONIQ SEVEN is the world’s first, all-electric passenger focused MPV with a focus on bringing an unparalleled level of connectivity and convenience to passengers. The ICONIQ SEVEN was styled by W Motors’ Design Studio in Dubai and features state-of-the-art technology from Microsoft including advanced image recognition, Artificial Intelligence (AI) and Cloud Solutions. ICONIQ MOTORS also showcased their new L5 Autonomous Vehicle concept. 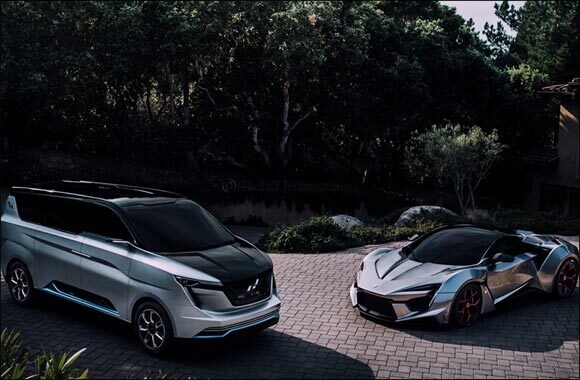 Designed by W Motors’ and supported by leading technology partners like Microsoft and AKKA Technologies, the L5 represents the company’s ambition to provide passenger focused solutions for the future era of Level 5 driverless mobility. This project is also supported by Masdar City and Safe City in the United Arab Emirates, and the first fleet of L5 Autonomous vehicles will be launched at the Dubai World EXPO 2020. The W Motors and ICONIQ Motors stand number 2231 is open to the press and public during the Geneva International Motor Show from March 6th until March 18th 2018.